I cannot upgrade the firmware form MacOS X El Capitain. It just say "Error during Update". We have forwarded your case to R&D and will post an update within 48 hours. I also have the same issue. Thought it might be because OS X Capitan, but had the same problem on a computer with OS X Mavericks. Thanks for the report. I need a little help from you guys so I have sent you a private message. Please hold, as we have only tested on 10.11.5. 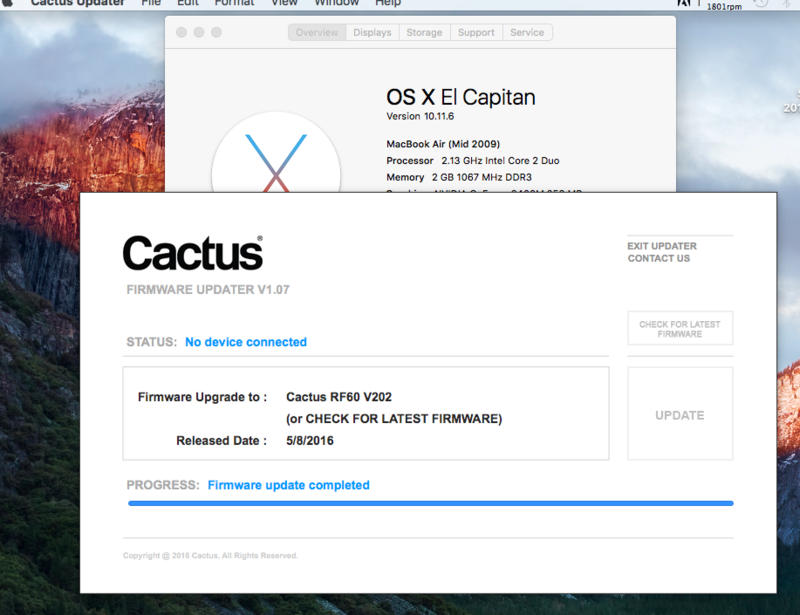 Hey guys, we were able to update using Cactus Firmware Updater 1.07 on our OSX 10.11.6. When you encounter an error during the update process, an error log file should be saved in the Home folder. Please let us know if you can find the log file and if so, what does it say. I have forwarded to R&D and I will post an update as soon as I can, or in 48 hours. Your patience during this time is much appreciated. Our R&D is still looking into the matter and they think they know what's causing it. So they are running tests on it now. As soon as I have an updates I will be sure to share with you all. Same here. Can't update the RF60's firmware on my Mac or a Windows 10 machine. Tried using the Mac beta updater with no luck. We have a new beta version for you to test. We tried it and it should fix the problem seen from the log file. Please let us know if it works for you too. Looks like it worked. No errors came up. Hopefully now I can do HSS with V6II. Thanks for working on the issue. We will upload it to the Downloads page accordingly. Once again we very much appreciate your understanding during this time.